Exactly what is canine demodectic mange? Canine demodetic mange is caused by a eight-legged, microscopic sized, cigar-shaped, mite that lives in the hair follicles of affected dogs. This may cause hair loss, irritation and predisposition to a secondary bacterial skin infection. These mites are a normal inhabitant found in canine skin. The immune system of healthy dogs is able to keep these mite populations under control. In an otherwise healthy animal these mites cause no harm to the host. In sick or injured dogs, young puppies, or animals with a weak immune system these mites are able to freely spread and cause a dermatitis. In severe cases of canine demodetic mange the mites can possibly spread over the animal’s entire body causing hair loss, irritation and secondary bacterial skin infections. Dogs affected with demodectes may have a genetic problem causing them to have a weak immune system and because of this these dogs should not be bred. Exactly what do these mites do to my dog? 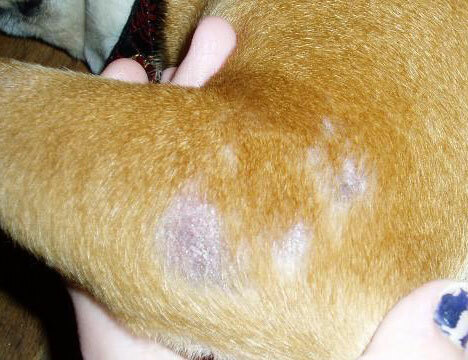 Usually there is not a lot of itching associated with canine demodetic mange mite infestation. In most cases the dog will start loosing hair on the head around their eyes. Sometimes other areas of the body may become affected as well. When the hair loss is only found in a few areas on the dogs body, it is termed localized canine demodetic mange. If the disease is spread over the entire body it is called generalized canine demodectic mange. How do I know if my dog has canine demodectic mange? This is a diagnosis that must be made by your veterinarian. Your veterinarian may perform several skin scrapings to test your dog for mite infestation. Here is basically how it is done. First, a few drops of mineral oil will be placed on the skin next to any suspicious areas. Then the dogs skin will be pinched to express any potential mites from the hair follicles and a scalpel blade will be used to scrape the top layers of the epidermis away. This sample will then be placed on a slide and examined using a microscope. The veterinary tech or veterinarian will examine the slide samples for the presence of demodectes mites. Several different scrapings may be necessary to find the mites. Occasionally the mites might not be found but the veterinarian will recommend treatment anyway based on the dogs health history and other symptoms that support the diagnosis of canine demodetic mange as a precautionary measure. How is canine demodectic mange treated? The localized form of canine demodectic mange is usually treated with a topical medication of some sort such as a medicated shampoo or dip. Shampooing with a medicated shampoo also helps to open the hair follicles prior to applying a medicated dip. The generalized form of canine mange requires a much more aggressive form of treatment. Some dogs may need to be treated in the veterinary hospital depending on the severity of their case. Overall, the treatments may take several months to complete. Other less severe cases of canine demodectic mange can be treated at home. Your veterinarian can easily recommend what is the best treatment(s) for your dog. Antibiotics may be prescribed as well if a secondary skin infection occurs. Some dogs with mange may also have hypothyroidism. Can my dog get canine demodectic mange again? Yes, a dog with canine demodectic mange may be prone to have relapses. If this happens it is important to begin retreatment immediately. In older dogs or in injured or very young dogs, canine demodectic mange often occurs due to a lowered immune system making relapse very possible. If you happen to suspect that your dog has canine demodectic mange, contact your veterinarian immediately. Treatments are available making this a very manageable condition but you must act to get the process going first.